With the recent surge in America’s engineering and technical services sectors, jobs in these sectors have become more readily available and those companies are looking to hire within the United States. Reviewing data from the Department of Commerce, the American Action Forum has found, positions in the Science, Technology, Engineering and Math (STEM) fields are on the rise in the United States. Also, the January 2013 New York City Real Time Jobs Report documents the existence of more than 300,000 unfilled jobs in the NYC area, with 30% of those jobs being in the field of science and technical services. However, the problem for many of these companies is that the number of qualified American STEM students is fewer than the total number of positions available. This translates into American companies having to relocate their company outside of the United States in search of skilled STEM workers. If America wants to continue to compete with foreign nations in the field of science and technology, we must do a better job in preparing our students. This can be accomplished with the government relinquishing its tight grip on current STEM financed programs, which will then provide states the flexibility to partner with STEM companies in the private sector, like IBM, to get involved in the secondary STEM education of its students. This partnership between states and STEM private professionals will have a tremendous impact in the creation of future generations of highly skilled American students in all STEM fields. The improvement of STEM education has emerged as one of the primary issues in proposals to reform America’s secondary educational system. The secondary educational system traditionally includes middle school all the way through high school. High school students with a good STEM background are generally ready to succeed in their post-secondary education and future STEM professions. 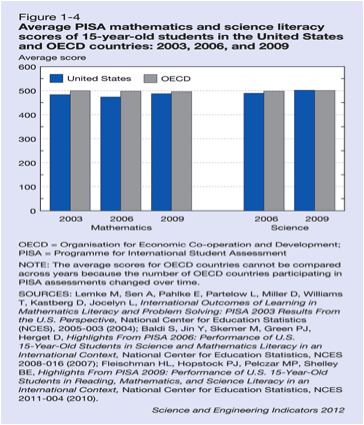 However, the recent trend indicates that American students in various secondary educational settings are less prepared for college, particularly among students pursuing a STEM career. Only 56% of students enrolled in a four-year STEM program receive a degree within 6 years of the start of their post-secondary education. Furthermore, 80% of students currently pursuing a STEM post-secondary education feel the previous education they received did not prepare them for the rigors of higher education. As a result, the STEM education American students are currently receiving has placed them at a global disadvantage with the higher STEM education level of other foreign nations. The million-dollar question now becomes, what can America do to provide its students with a stronger STEM education system in order to compete both at home and abroad. The answer lies with the United States federal government loosening its tight grip on current educational regulations it has placed on states and school districts. The United States Government Accountability Office found that 13 federal agencies invested over $3 billion in 209 programs designed to increase knowledge of STEM fields and attainment of STEM degrees. With the high quantity of federally funded STEM programs, a problem of duplicity and consequential overlap has emerged, leading to ineffectiveness and inefficiency. Analyzing and comprehensively correcting the areas of duplicity within each agency and their respective STEM programs will make each program more effective and successful. It will also provide an efficient strategy for the federal government to invest its limited federal funds in order to achieve the greatest impact in developing a pipeline of future workers in STEM fields. The goal for the federal government should be to give states maneuverability with federally financed STEM programs. This will allow states the flexibility to address the needs of their students in whatever fashion they deem fit, which includes partnering with private companies. States and local districts are realizing that the best route to improving STEM education is partnering with private corporations that already work in the STEM profession. A prime example of a local district addressing its shortfalls by partnering with a private company occurred between technology giant, IBM and the NYC Department of Education, the NYC College of Technology and the City University of NY. This partnership produced a transformed secondary school, which was named Pathways in Technology Early College High School. At this juncture in the schools brief history, nearly half of the program’s 10th-graders (members of the school’s inaugural class) are already taking and passing college courses, overachieving on the Preliminary SAT and showing additional, quantifiable evidence of STEM progress. More private STEM businesses and corporations investing in secondary STEM programs will help states and local districts strengthen all areas of their STEM education. Our current federal government has enough on its plate between current fiscal negotiations and their creation of numerous federal STEM programs with considerable overlap. Consequently, the government needs to find a way to minimize the overlap, to ensure that federal STEM aid is providing states not only with the right amount of resources but also the flexibility to educate their students in the way they deem fit. The tractability found in the reformed federally financed STEM programs will likewise encourage states and local districts to work with the private sector. This will in turn lead to an improvement in the STEM education for all our students, which will also have a profound effect on getting more minority students involved in post-secondary STEM careers. STEM students will be a key contributor in the growth of America’s economy and investing in these STEM students should be our nation’s main educational objective. Tags: Barack Obama, Education, education system, engineering, government, math, Science, STEM fields, United States. Bookmark the permalink. Insightful. What do you influences a corporation’s initiative to invest in academia? Public trading versus private ownership? Existing pathways/connections?